One thing anxious people are prone to having is an agitated mind. There can be many unwanted or intrusive thoughts flowing through fast inside one’s mind. With my clients, I often equate this anxious mind to be akin to a storm. I call it the anxiety storm. Whenever someone is caught up in the anxiety storm, one tries too hard to calm down, by either distraction or going head-to-head with the anxiety and fighting it out. Rarely do either of these strategies work. I teach my clients about the power of acceptance and surrender, which works wonders. With this strategy, you are not resisting any scary thoughts. You accept and allow it. Without any resistance to push against, the storm has no impact. Over time, the anxiety storm gives way, and in comes the light of clarity. Sometimes, it doesn’t work out this easily. In the midst of an anxiety storm, people get confused about how to meet anxiety with acceptance. They start getting inside their heads and it only aggravates their situation. In such a scenario, I advise people to shift their awareness from the mind to their body. This technique is extremely helpful for someone like me who very much lives in his head. We modern day humans forget that there is a body attached to our heads. We tend to live inside our minds most of the time. It took a long time for me to realize the potential of body awareness. Once I realized how helpful it was to move my awareness to my body instead of getting caught in mental traps, I was on the path to recovery. Experiencing anxiety in your body is very different than getting caught up in the anxiety mental storm. Of course, it is still unpleasant – there’s no denying that. Even when you move the focus to how the anxiety feels in your body, you will still feel scared and restless. Shifting the focus doesn’t immediately make the anxiety go away, but there are several key benefits. When the focus is on your body, you don’t get caught up in the scary thoughts of your anxious mind. You experience anxiety as just body sensations. The fearful thoughts don’t take over your mindspace. This is because, without your attention and awareness, such thoughts weaken. The vicious feedback cycle of anxious thoughts producing more anxiety-ridden thoughts is broken through body awareness. When experienced in the body, anxiety just becomes a series of raw sensations. It sometimes will feel like compression in your chest. You may experience difficulty breathing. Other times, it can feel like some energy moving through your body. Occasionally, you’ll feel heat in certain parts of your body. How one experiences anxiety may vary differently from person to person. Noticing what anxiety feels like in one’s own body helps you to stay present. The anxiety storm is all about fear of the future. Sometimes that future could be just the next second. The mind comes up with several scary thoughts such as “What if I have a panic attack?” or “What if I lose my sanity?” They are almost always future oriented. But when you let anxiety take over your body, and just focus on the sensations it produces, then you are grounded in the present. You get a break from future-oriented anxious thinking. You can see that, in the present, all that is happening to you is a series of sensations in your body. They are scary, they are unpleasant and they may even be weird, but you are not getting caught up in the “What-If” thoughts of your highly agitated mind. When you start buying into the mental confusion created by the anxiety storm, you strengthen it. To weaken it, you need to move your attention elsewhere. You cannot defeat your mental anguish by stressing your mind even more. A lot of us have tried this several times before and failed. You cannot think or argue your way out of anxiety. In this case, you cannot fight fire with fire. You have to use water to extinguish the fire. 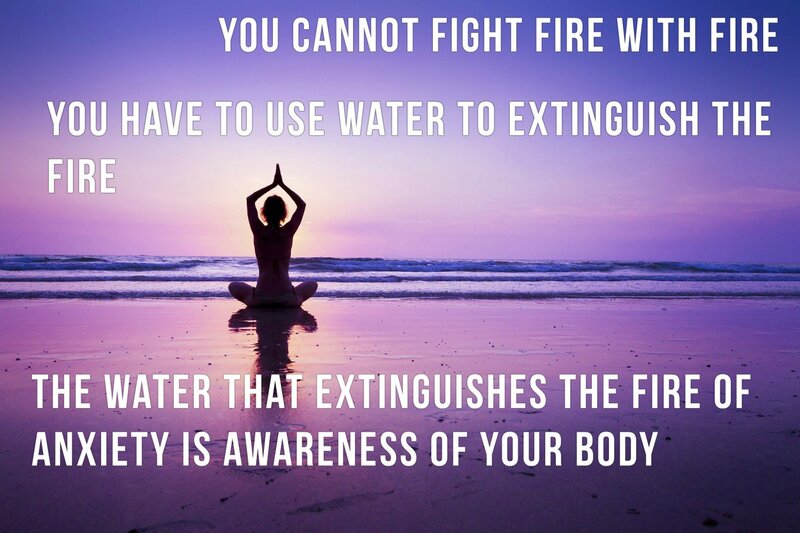 The water that extinguishes the fire of anxiety is your body awareness. Try this. The next time anxiety takes you for a scary ride, accept it. Surrender to the ride while gently keeping your focus on the body. Notice what it feels like, in your chest or your belly, to have anxiety coursing through you. Breathe gently and notice where the sensations are strong in your body. Go towards these places by shifting your awareness to those local areas. Even today, when my anxiety flares up, I get caught up in whatever scary thoughts my mind conjures up. It takes me a few seconds before I realize what I have to do – shift my focus to my body. This takes a lot of practice and patience. 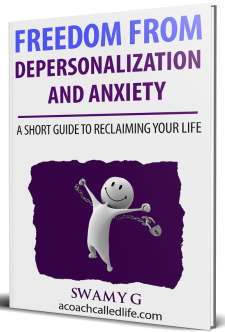 The more we start inhabiting our body instead of simply living in our heads, the easier it will be for us to recover from any mental affliction. The fearful thoughts in my head are around bizarre bodily sensations triggered by anxiety so focusing on them fuels rather than quells my anxiety! I wish this technique was helpful but unfortunately not for me. It always gets worse before it gets better. When you open yourself up to experiencing anxiety without resistance, it is going to feel uncomfortable at first. But if you slowly keep exposing yourself to the anxiety (by experiencing it in the body), you are going to get comfortable with it. Take it at your own pace.